Senator Elizabeth Warren of Massachusetts expressed her opposition to efforts to roll back some bank regulations. 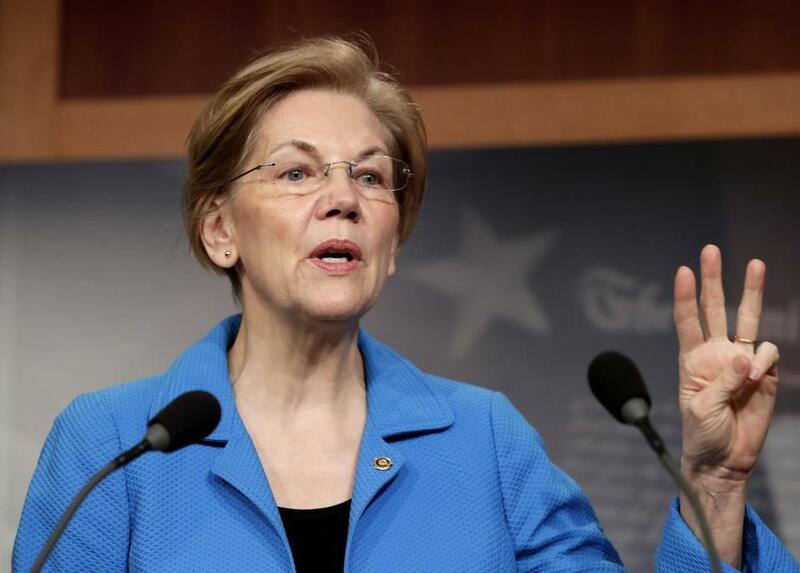 WASHINGTON — Senator Elizabeth Warren blasted out a political hit list of senators voting to “roll back the rules on the biggest banks” to her many followers this week, signaling to the liberal resistance which lawmakers to target. Nothing unusual about that — except 16 of those lawmakers are Democrats. “If Republicans and some Democrats are going to help the bank lobbyists roll back Wall Street reform, we’re going to make sure the American people know about it,” Warren said in the Facebook post that named and shamed her own colleagues. “Dems for Wall Street need to go,” one commenter wrote in response. “This bill wouldn’t be on the path to becoming law without the support of these Democrats,” Warren wrote on Twitter. Warren’s unusually aggressive advocacy against members of her own caucus this week is raising eyebrows in the Capitol, where Democrats have so far managed to avoid many of the bitter battles that divided them during the 2016 presidential election. The compromise bill, which could be voted on as early as Thursday, would exempt banks with $50 billion to $250 billion in assets from some of the 2010 Dodd Frank financial reform law’s oversight, as well as easing liquidity requirements for large banks. It leaves untouched the Consumer Financial Protection Bureau that Warren dreamed up and later launched her political career on. On the Senate floor Wednesday, Warren said rolling back regulations “makes perfect sense in Washington, where swarms of lobbyists seem to have the power to erase politicians’ memories” of the decade-old financial crisis. On MSNBC, she torched Democrats and Republicans for celebrating the 10th anniversary of the recession with a bill that would lighten regulation on financial institutions. Warren plans to introduce more than 10 amendments during the floor fight, potentially forcing her colleagues to take more tough votes. Many of the 16 Democrats who voted to advance the measure are facing daunting reelection fights this year in red states that voted overwhelmingly for President Trump in 2016. Senators Jon Tester of Montana and Claire McCaskill of Missouri are among them. Having regional banks and local credit unions up in arms during an election year would be just one more daunting political hurdle for this group. Republican political operatives are delighted to see Warren leading the charge against members of her own party on an issue that animates liberals. Red-state Democrats are unlikely to lose support from voters in the center or center-left by drawing Warren’s ire, but the progressive activists and donors in their states could be demoralized by it, they hope. But not everyone agrees with the political calculus red-state Democrats are making. Representative Raul Grijalva, a Democrat from Arizona and a member of the House Progressive Caucus, says he thinks moderate Democrats may be miscalculating in backing this bill, ignoring the growing strain of populism in the country at their own peril. Warren is doing them a favor by pointing this out to them now, he said. “If there’s one theme that Bernie and Trump shared, and this is a horrible thing to say, it’s their disdain for the rich people and corporations running us,” Grijalva said. Both of those candidates said they didn’t want big money influencing their campaigns — with Trump claiming he would self-fund, and Sanders that he would reject SuperPAC donations. There’s no room for subtlety in this debate, Grijalva said.